Windows Media Player album art... blissed! 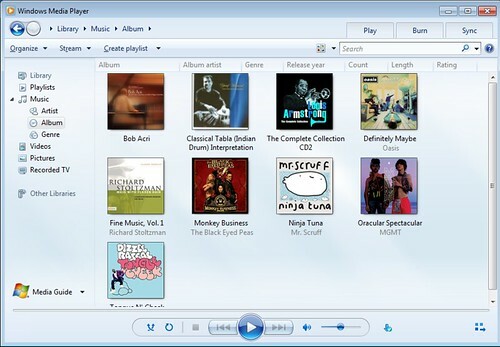 Windows Media Player (sometimes abbreviated WMP) is a veritable stalwart of the digital music scene. 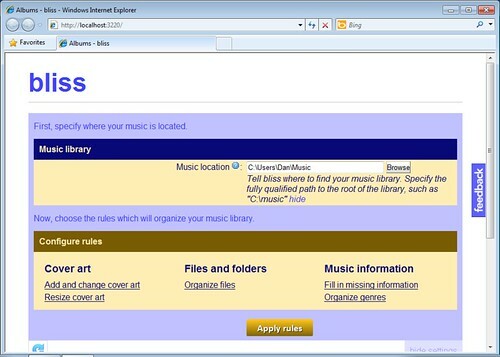 Now in its twelfth version, and still distributed free with Windows operating systems, it's a default option for Windows users to play MP3, WMV files and the rest. To many, it's also the first experience they have of digital music, so it's a shame that Windows Media Player's support for album art can be lacking. 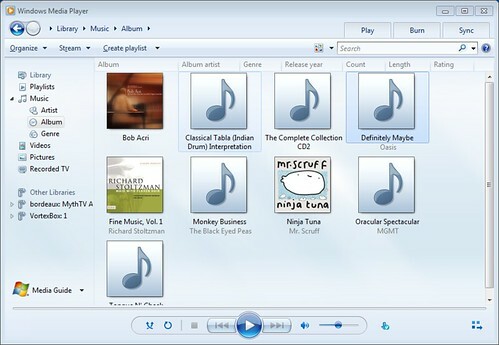 How does album art in Windows Media Player work? 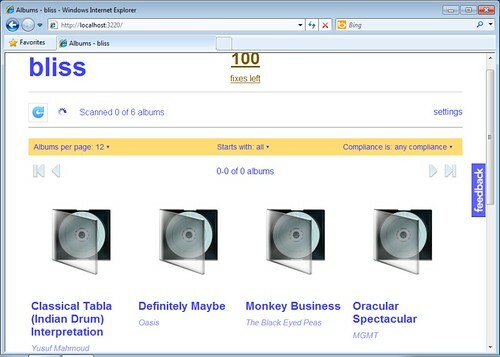 If you have an existing music collection, WMP can recognise art in two ways. Firstly, it can recognise art embedded into the music files. Secondly, it can recognise separate image files co-located in the same folder as the track files. The most recognisable of these is 'folder.jpg', amongst some more arcanely named files. So, to provide any existing art you have to WMP, simply embed the art into music files or save it to a separate folder.jpg. 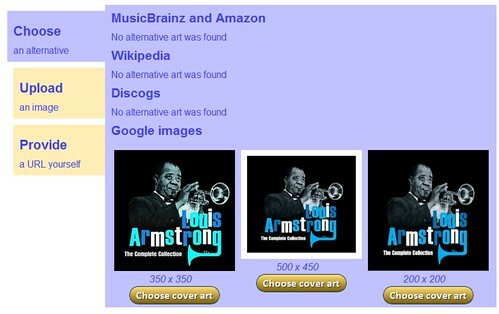 If you don't have the art, WMP provides a feature to find the artwork and other metadata about the music. You do this on a one-by-one basis, right clicking the album, choosing "Find Album Info" and confirming the selection. Great, so that's album art for Windows Media Player sorted, right? There are two main problems with how album art works with Windows Media Player. First, for anyone with a reasonably sized music collection of several hundred albums (maybe more) this will take a long time. Right click, wait, confirm. Right click, wait, confirm. Most people would probably rather be doing something else. Such as actually listening to the music. Second, the online music database from which WMP downloads album covers is not exhaustive and neither are its matches always accurate. Ignoring the comes-with-Windows albums by Bob Acri, Richard Stoltzman and "Mr. Scruff", we have a complete absence of album art. Album art, as we know, is all part of the digital music experience. So I fired up bliss to complete all the album art. Once installed, I started bliss from the shortcut on the Desktop. Once I 'apply rules' bliss begins assessing my albums for whether they already conform to the rule I just configured. Namely, the art must exist, be embedded in music files and saved in a folder.jpg. If it doesn't, it does the work to make sure it does. If the art exists in, say, the folder.jpg but is not embedded, bliss embeds it from the folder.jpg. If the art doesn't exist at all, bliss finds the artwork on the Web. Once that's done, I review any albums where art could not be found. On the right there's one example, a Louis Armstrong compilation. Cool! Windows Media Player album art... sorted!